A journey to the Congo border, the Burundi border and back over the last 3 days has again been some of the most indescribable events of my life. The intention of the trip was to meet two of our co-operatives in the south west corner of Rwanda and that meant 6 + hours in the bus with not real stops for lunch or washrooms. This trip has been a real test for us all physically, mentally, emotionally and spiritually and I am happy to say that we are an amazing group who communicates well and make the best of every situation. On the Burundi border was a group of Twa (Pigmy) that have never set eyes on Muzungu’s (white people) before. We were again greeted by intensely raw traditional dancing and singing which was my favorite so far. The feeling I had as I watched was one of awe and complete amazement. I was speechless at some points during our celebration. Actually, as we traveled to the co-operative I was again filled with a lot of emotion and felt very tired. During the ceremony we were given many gifts and the intense emotion that has been building since I arrived finally had a chance to be released. Being presented with a simple pineapple literally left me sobbing. These people have virtually nothing and yet they offered us 4 rounds of gifts including fruit, hand made crafts and pottery, and grains with such joy and gratitude. I have been given many things in my life for which I am grateful but I have never before been given gifts with such intensely pure love behind them. This experience has opened my eyes even further to the power giving from the heart as well as learning to accept love when given to me, in whatever way it is offered. After the emotion was released from my body through tears I was rejuvenated and felt alive. I was able to offer song and dance with a new openness and even allowed myself to let out some joyful, primal noises that felt so natural and good! These people have considered themselves to be like animals, not human, until only 4 years ago and are just now making the transition from hunters to farmers and becoming a part of Rwandan society. My mind wonders why we see progress in the form of further removing ourselves as humans from our own animal nature. Is it really advancement to strive towards the concrete jungles that we call home in the North America, or to a life that pulls us further away from being able express ourselves in the most authentic and raw way we know how? How do we find a balance between surviving at the most basic level in our ever changing world and staying connected to our own humanness? Being a part of the new NGO (Non-Governmental Organization) World Dance 4 Humanity is giving me the opportunity to see just how delicate this issue is and is giving me more insight into how I want to be of service in the world. There is a place for every personality type, every way of life, every view, every skill and I get to choose which path feels right for me. This opportunity has been life changing for all of us in many ways and I am seeing how peeling back the unique layers of my own life are beginning to reveal the gem that lies within. 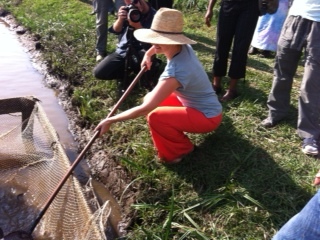 We also visited a co-operative near the Congo border that has started a fish farm project, digging 4 huge fish dug outs by hand which took 6 months to do. They have rabbits in pens that stand on stilts above a section of the dug out which provided food for the baby fish via rabbit dropping. They also have cows donated by World Dance that are doing very well. The ingenuity of these people and the determination is unbelievable. 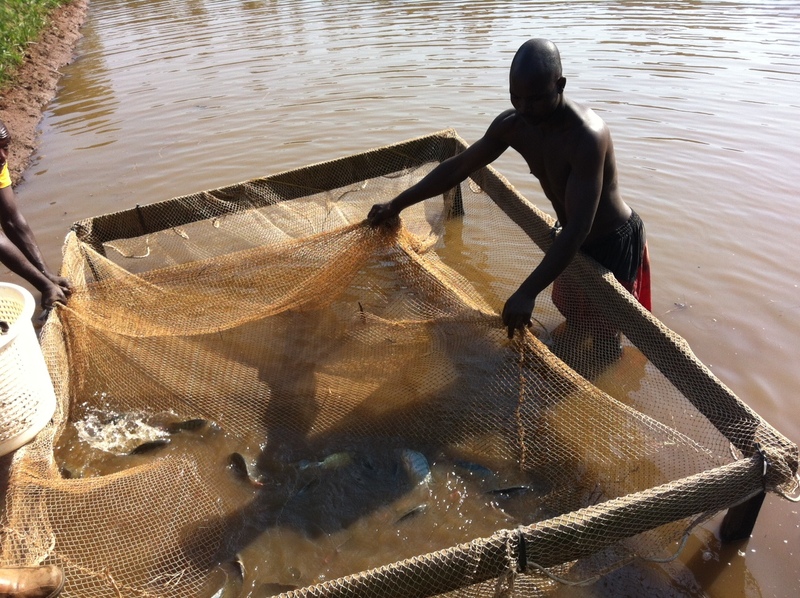 As we drive 6 hours out of Kigali and into what feels like no-mans land suddenly coming upon a fish farm, I am reminded of just how much effort these people have out into their own survival. I had the opportunity to tell them all how inspired I was by their efforts and that they are a real life demonstration of living and being the change they want to see in the world. They have made what would seem to some to be the impossible, a reality. We were there to celebrate not only the development that has taken place with the support of Goats for Life and World Dance but also the first harvest of fish AND the grand opening of their fish store. We were witness to the first exchanges of money for the fish and really the creation of a completely new life for these people. Justin was giddy with excitement as we left the area for home. “This is so incredible!” he said repeatedly. We have already made new connections for possible ECO tourism with a near by 5 star hotel “Nyungwe Forest Lodge” (an amazing sight to be seen in the middle a tea plantation near Cyangugu). I was able to also meet with the manager there and was pleasantly surprised at his interest in all of my skills. I am beginning to put out seeds for possibilities here in Rwanda and I am so excited to see what will come next in my path. To be witness to the forward momentum of the people of these two co-operatives as well as know that my life is taking on a whole new vision as well is very, very exciting. The reality to the fact that I am one of those people who loves what they do in life, everyday, is really starting to sink in. Finally, I feel as though the deep healing part of my journey is coming to a close and the gift of all that hard work is now my reality. So much gratitude to everyone who has supported my along the way.